You sure six instants/sorceries is enough to ever flip Docent of Perfection reliably? 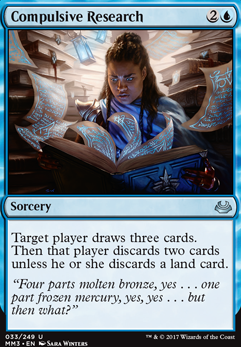 You could swap some of the enchantments and artifacts out for cards that do similar things in spell form. Pacifism could be Swords to Plowshares and Skywise Teachings could become Midnight Haunting . Your artifacts don't seem to contribute much - the Banner is too slow and the Spike seems counterintuitive if you're going for a token swarm - so they could become more inxpensive card draw or removal. Azorius Charm , Compulsive Research and Disenchant are all good options. And see if you can swamp Anticipate out for Impulse - it's a strict upgrade! 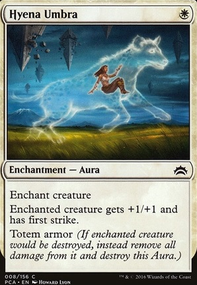 lonesentinel on PDH-Are my creatures vanishing or is it your deck? 1) Not a fan of infinite combos! 1a and 3) I originally put in Mnemonic wall/ Dream stalker but because they arent Wizard or Human, I took them out. This is because I put in Path of Ancestry for scrying. 2) Yup, originally had it in and I took it out because I'd thought 1 was enough. On this idea, should I be going for the Wincon 1 combo all the time? 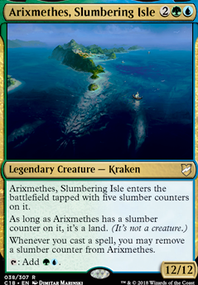 3)Darting merfolk only bounces herself so she has less versatility than the Shrieking Drake or Dream Stalker. The idea I had originally was for my commander to be the main target of bounce/flicker effects. 4)Although bouncing is good, I suppose you mean this combo must be paired with the Peregrine Drake? I guess I could see it as a way to stall the game. At the end of the day, my main wincon is to mill the opponents out. 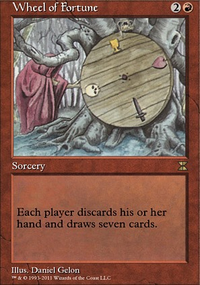 5)I thought it would be interesting to put in a cantrip that is mill-themed haha. 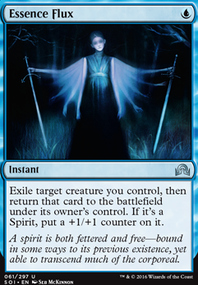 I'd opt for Opt instead because its instant speed and I dont have copies of serum visions/preordain. I have Secrets of the Golden City already inside. However, instead of the traditional Counsel of the Soratami/ Divination, I used Vision Skeins , Words of Wisdom because they are at instant speed, and helps in the game plan a little. 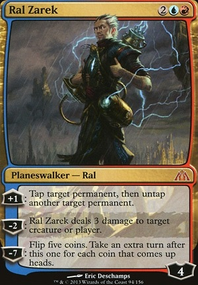 I also used Taigam's Scheming , Contingency Plan , Sift , Strategic Planning , Compulsive Research because they help to run through my deck faster, and also has a discard clause for Delirium trigger. I like your deck idea here. 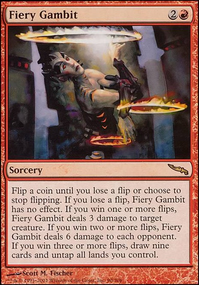 As for your suggestions, I think I would try to switch in Snake Umbra , Ophidian Eye , and Tandem Lookout for some of your loot effects, like Frantic Search , Amass the Components , and Compulsive Research . I think you should also consider running some little unblockable dudes, like Metathran Soldier , who will benefit from these enchantments. yo TheMillKid thanks for your suggestions! As for Ideas Unbound , Concentrate , Harmonize im not convinced. I dont like the idea of sorcery speed card draw. So, it try to avoid that if possible- better to play it EOT. 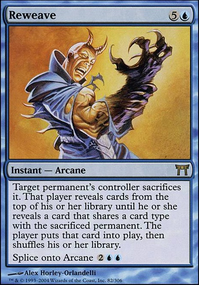 Tezzeret's Gambit is sorc speed too, but low cost and provides additional value through proliferate. Breakthrough is nice because of the fact that it provides Draw trigger for really low mana cost. So i consider it after the next few games... very possible inclusion! Careful Consideration is exactly what i need! Similar to Breakthrough and instant speed! Included! Cephalid Coliseum well i need a copy of it! Nice! Will Include! Compulsive Research is a bit tricky. I need early lands and run a bit few... ill keep it in mind! Ordeal of Thassa multipurpose. Included! I think KayneMarco has a good point about cards like Rogue's Passage . Key to the City is another good option, since it's cheap, and actually can provide a bit of additional card advantage. Some extra low-cost draw spells to pump Toothy could be Ideas Unbound , Concentrate , Harmonize , Ancestral Vision , Breakthrough (although this one has a big downside), Careful Consideration , Cephalid Coliseum , Compulsive Research , and Ordeal of Thassa . 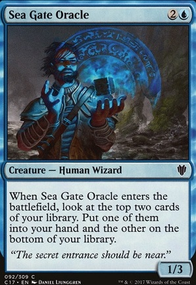 On a related note, Thassa, God of the Sea would be another good addition, smoothing your draws with scry while also providing another way to make Toothy unblockable. I honestly believe Song of the Dryads is one of the most powerful removal spells around, because turning a commander into a Forest just invalidates them until the enchantment is destroyed (because their forest general isn't destroyed by cards like Wrath of God ). Thanks for suggestions! Monastery Mentor is probably out of my budget right now, but I would slam dunk him to this deck if I had one. Im not sure how I missed Rootborn Defenses (as I'm always mad at Artful Dodge not being an instant). And Myriad Landscape because I put it in nearly all my 2 color decks. But ramp actually feels okay in this deck, I have no problems casting my pricier spells, so I would probably put Wayfarer's Bauble only to replace other, worse ramp spell. Maybe I should experiment and try how this deck would work if I replaced all those draw cards with cantrips.